Another product I have been meaning to review for a while and has been my go to lip product since getting my hands on it a few months back. 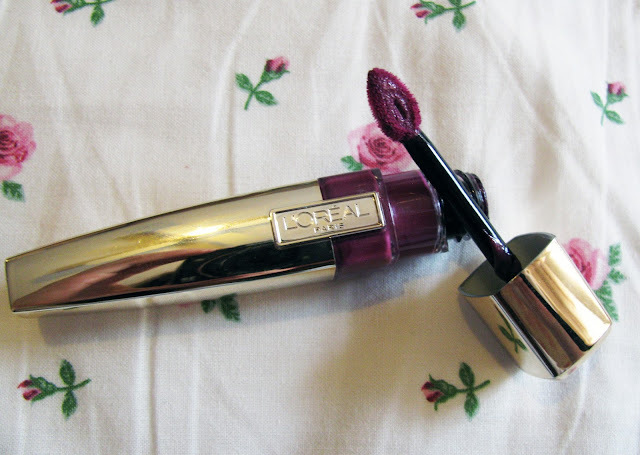 I'm of course talking about the L'oréal Glam Shine Stain Splash, what a mouthful of a name! The L'oréal Glam Shine Stain Splash came on the scene a few months back and were described as the latest innovation in lip stains. With this being L'oréal's first lipgloss that acts as a stain. The 30% water based formula is designed to give amazing lasting colour with a shine that appears like a gloss with results said to last up to 6 hours without drying out. For me this has been my staple lip product for a few months now and is my go to lip product for nights out. I love it, which is odd for me as I hate using lipglosses as they smear everywhere and my hair gets stuck to my lips too often for my liking. These however in my eyes aren't a lipgloss, because they aren't sticky at all and dry super quick leaving a lovely colour to my lips with a shine that make it look like a lipgloss. The shade I own is 'Milady', which is a really nice deep plum colour (surprise, surprise) that just brightens up my skin tone and completes any makeup look really nicely. Also not to forget, the lasting power on these things are amazing! I only need to reapply once or twice throughout the day normally after eating/drinking but as this is a lip stain don't be shocked when you're left with a slight tint to your lips but it does eventually come off. Have you tried any of the L'oréal Glam Shine Stain Splash's? These look great... a perfect cheaper alternative for the YSL Glossy Stains, which I love! I have two of these, Remy and Marilyn. I love them. I'm currently running a MAC lipsctick giveaway.